Poker Dice is a dice game that allows you to play a game of Poker with dice rather than playing cards. The game can be played either with standard six-sided dice, or with special Poker Dice with faces showing Ace, King, Queen, Jack, 10, and 9. If you're using standard dice, it's helpful to think of the pips as corresponding to card values: 6 = Ace, 5= King, 4 = Queen, 3 = Jack, 2 = 10, and 1 = 9. 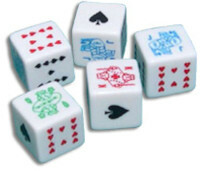 Each player has their own set of dice, and may make up to three throws, with the object of making the best possible poker hand. After each toss, the player can set aside any dice they wish to keep. After each player has had a turn, the hand with the highest rank wins the round! As in regular poker, games can be played for fun or for the stakes of your choice.